I first heard of The Vine Hotel when The Age mentioned their chef Ron O’Bryan uses Heston Blumenthal’s 15 second flip method – my personal favourite way of cooking steak. Enthused by this new information I set out to test how well a real chef could make a steak using this method. 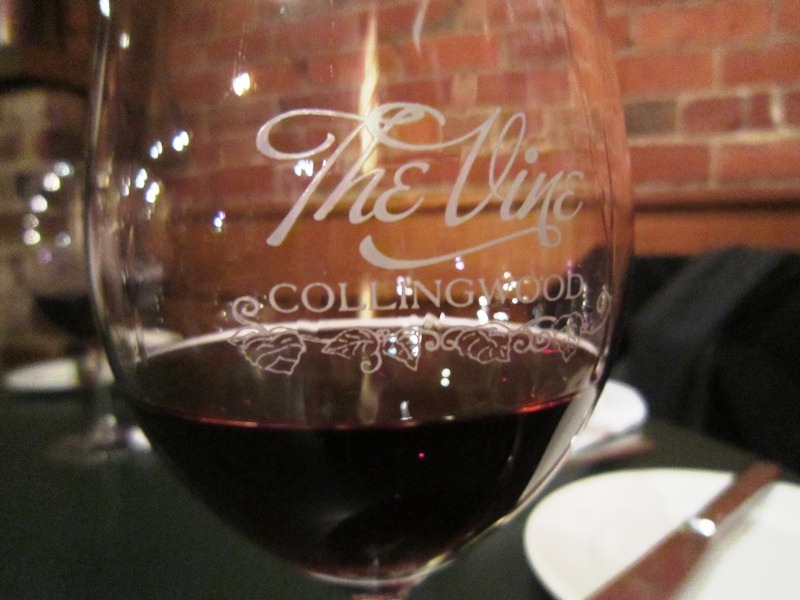 It was a rainy Friday night in Melbourne when we arrived, from what I’d read I was expecting a chic new-wave gastro pub but was surprised by a local country atmosphere. The tables were set in elegant fashion – wine glasses, cloth napkins (you know the drill) – however it resonated a very roadhouse feel, with the décor being timber and brick veneer with a fireplace along the back wall. I dug the vibe, but do recommend bringing a sweater as the temperature in the venue was somewhat cold. We were seated and handed menus to which I started to browse through the list of different cuts of steak. Cut wise it was a list of the usual suspects, porterhouse, eye fillet (also available as a fillet mignon), scotch fillet, rib eye and rump. The rump being wagyu was surprisingly the cheapest however the “maitre d’” assured us it was nothing to do with quality but more to do with the supplier trying to promote their product. I decided her story seemed plausible as I’d never heard of Robbins Island wagyu before. The other cuts hailed from various suppliers, no two from the same place, providers included King Island, Margaret River, Grasslands and Tara Valley. All steaks come with a choice of salad or vegetables (served separately) and a choice of mustards, horseradish, garlic butter or café de Paris butter. I chose the grass fed Tara Valley rib eye (min wt. 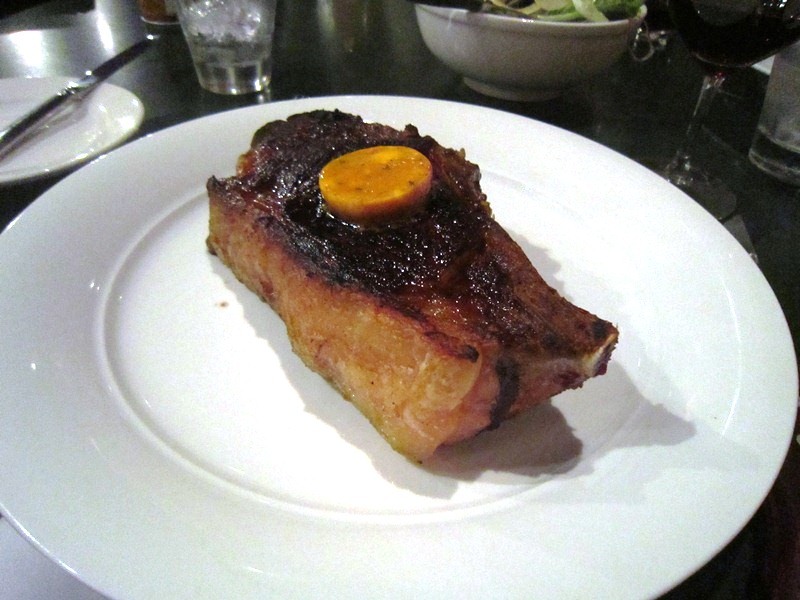 600g) ($38.9) ordered rare to medium with café de Paris butter. My dad picked the Grassland Angus MBS2+ scotch fillet and to my dismay asked for it to be cooked medium to well also with café de Paris butter and a red wine jus. About half an hour later the steaks arrived. 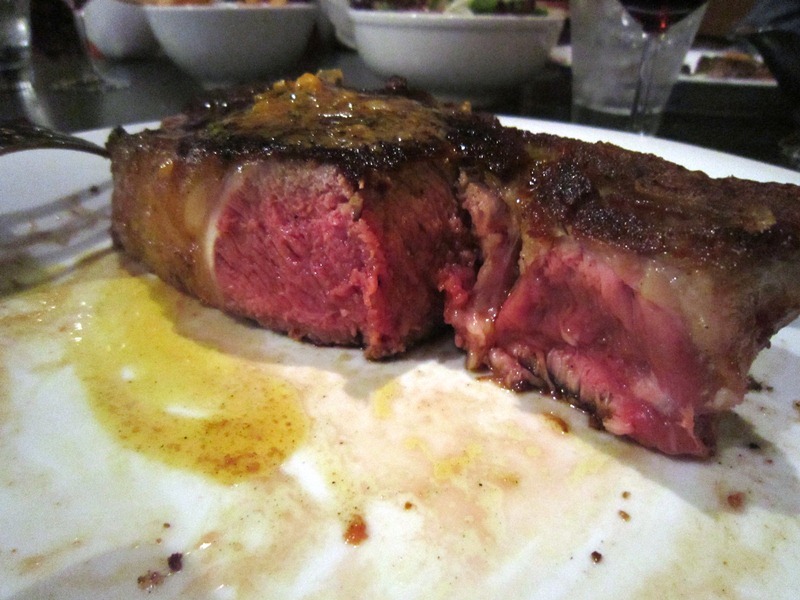 First impressions were good with the steak having a deep brown colour, and a nice line of fat on the rib eye. The outside was deliciously crisp while the inside was juicy and cooked incredibly well. The crisp outside complimented the juicy and tender inside well, while the butter added a slight depth with the addition of the herbs and garlic. It made for a great overall steak with a fine, albeit sweet, beef flavour which stayed with me long after I had finished the meal. A couple of things I did observe was that it seemed to be grilled in a pan rather than a char-grill , which is how the crust was formed during cooking and the piece wasn’t trimmed of fat which over time became more challenging to eat. 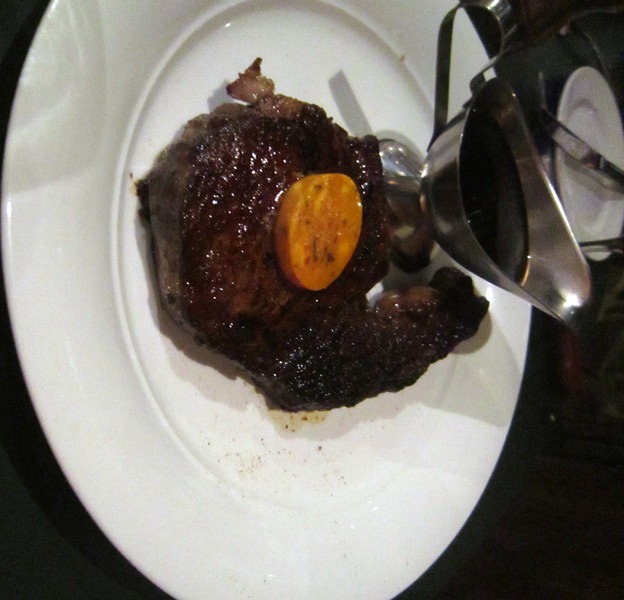 Posted on September 23, 2013 October 13, 2015 by AdrielPosted in Melbourne, SteakTagged Great, Melbourne, Moderately Priced, Rib Eye, Steaks.